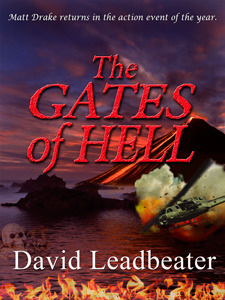 The Gates of Hell by David Leadbeater follows on directly after the events of the previous book in the series, The Blood King Conspiracy (review here). The previous book ended rather abruptly for my liking, and left us hanging, needing some sort of conclusion. The Gates of Hell provided that conclusion. The Blood King has been traced to the islands of Hawaii, and the story is all about tracking him down, and stopping him from discovering what lies beyond The Gates of Hell. The Blood King does not make his pursuers task easy, and launches multiple terrorist attacks at locations on the islands as diversions. This was a much darker thriller, and much slower paced than the previous two instalments. A lot of the slower pace was down to character development and I liked that we were learning more about the main protagonists. The story isn’t conducted entirely at a leisurely pace though, and once the team enter through The Gates of the title, it's action all the way to the conclusion! To be honest, although I enjoyed the story, I think that if The Blood King Conspiracy and The Gates of Hell had been edited down into one book, it would have made for a much more satisfactory read.